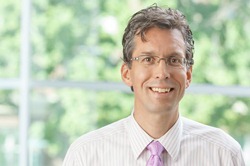 UNMC › Radiology › Faculty › Matthew White, M.D. Principal Investigator –Matthew L. White, MD. The goal of the study is to evaluate subjects with primary intra-axial brain tumors to see how MRI brain tumor perfusion predicts overall survival and progression free survival. The MRI brain tumor perfusion methodology is contrast based (Multihance) utilizing echo-planar techniques. Multihance, given its underlying molecular attachment to gadolinium and weak affinity to serum albumin, has been shown to be superlative for echo-planar MRI perfusion analysis. Given the excellent characteristics of Multihance it was utilized for our MRI brain tumor perfusion exams. Hypothesis: We hypothesize that MRI brain tumor perfusion will provide information that is predictive of overall and progression free survival times in subjects with primary intra-axial brain tumors. White ML, Zhang Y. Three-tesla diffusion tensor imaging of Meyer's loop by tractography, color-coded fractional anisotropy maps, and eigenvectors. Clinical Imaging 34(6): 413-7, Nov-Dec 2010. White ML, Zhang Y, Healey K. Cervical Spinal Cord Multiple Sclerosis: Evaluation with 2D Multi-Echo Recombined Gradient Echo Magnetic Resonance Imaging. The Journal of Spinal Cord Medicine 34(1): 93-98, January 2011. White ML, Zhang Y, Yu F, Kazmi S. Diffusion-Tensor MR Imaging of Cerebral Gliomas: Evaluating Fractional Anisotropy Characteristics. AJNR Am J Neuroradiol 32(2): 374-81, February 2011. Wilson TW, Franzen JD, White ML, Knott NL, Wetzel MW. Broadband Neurophysiological Abnormalities in the Medial Prefrontal Region of the Default-Mode Network in Adults with ADHD. Accepted Human Brain Mapping. Published online Nov 18, 2011. Bravo E, White ML, Olney AH, Mcallister JL, Zhang Y. Novel proximal 14q deletion: Clinical and DTI tractography findings in a patient with lissencephaly, agenesis of the corpus callosum and septooptic dysplasia. Published online Dec 22, 2011 AJNR Am J Neuroradiol. Accepted for publication. Wilson TW, Wetzel MW, White ML, Knott NL. Stimulant Medications Normalize Gamma-Frequency Neuronal Activity in Adults with Attention-Deficit/Hyperactivity Disorder. Accepted The Journal of Psychopharmacology. Published online Jan 4, 2012.